Azule sponsored the 4x4 off-road challenge, which was hugely popular. Driving through deep puddles and foot deep mud was great fun, but the Land Rovers were a little more basic than I'd imagined. The air con consisted of winding the window down. 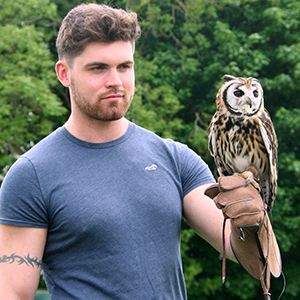 Presteigne sponsored the Falconry display which was pretty amazing. One particular falcon was apparently valued at 250,000GBP, or, as I explained, just 7,700GBP per month over 3 years!! Not that we've ever funded a bird of prey before. Vinten sponsored a pretty cool ferret and dog racing area, and Panasonic sponsored a laser clay-pigeon shooting competition which was great fun, and which got hugely competitive, or was that just me? The evening award ceremony was also a great success, and it's always an award worth winning when you are nominated by your peers. Well done to the winners. From a purely work perspective, it was a good day for us, evangelising about Azule and how we can help camera operators with their kit purchases. We have invested a lot of money in our on-line application process, and we can now give on-line acceptances on anything up to 25,000GBP immediately. It's also interesting speaking to cameramen about finance, and dispelling the myths around financing for freelance camera operators. The misconception is that a finance company would not lend money to them as they are "just a freelance cameraman". The reality is EXACTLY the opposite. I know cameraman look after their own kit better than any other market sector that we deal with. And cameramen rarely " go bust", so it's a pretty safe bet. The trick is to make it really easy for a busy cameraman to arrange the finance, which is where the web site comes in to its own. Most of our web applications come in out of office hours. I'm left with a great feeling of good will and common purpose after these days. I guess that being a freelancer in any genre can be a lonely pursuit. So belonging to a club of like-minded individuals gives a sense of belonging. There was also a great mix of ages and skill sets. There were a few students from a media college who were invited along, and the Guild extended its invite to family members too, and it was great to finally meet the son of an industry friend I've known for 15 years.